The owners of this Victorian house needed an additional WC for their growing family. I was able to give them some ideas about layout, the above being the most space saving and economical using and adding to the existing plumbing. Access to the shower is via the bathroom tucked behind the new WC cloakroom. The living room in this lovely 1930s house is very wide and dominated by a large brick fireplace which is the first thing you see when you enter. By splitting the room into three areas furnishings can be grouped and not 'float' around the entire space. 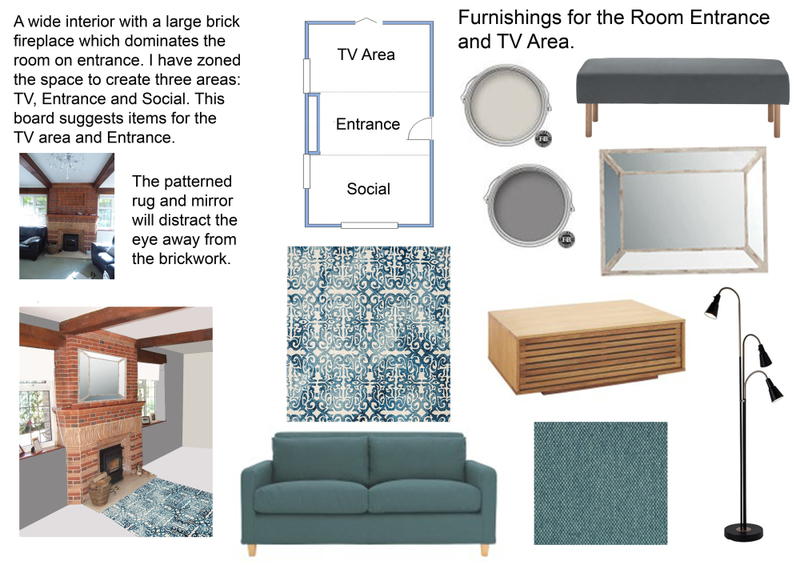 The patterned carpet in blue and grey will lift the eye away from the brickwork and the large mirror reflect light away from it. Soft greys and blues were chosen for this interior flowing through the areas. This board concentrates on the entrance and TV area. 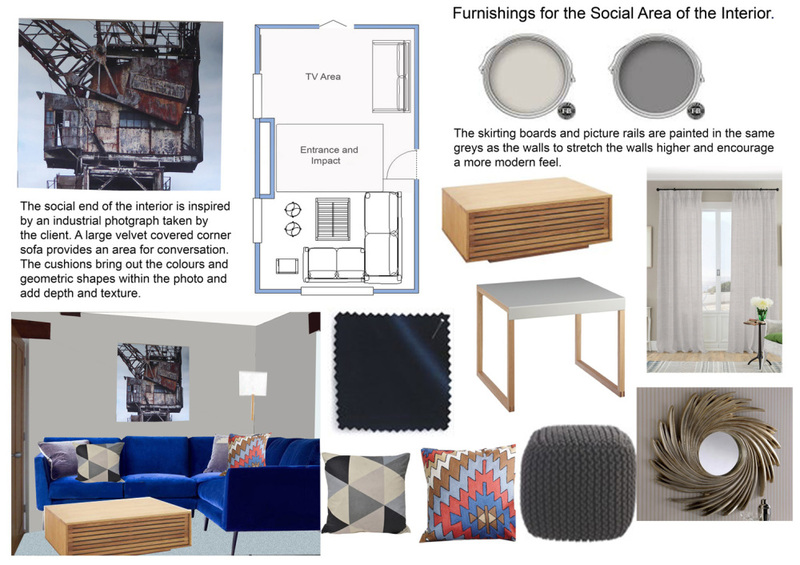 Furnishings for the social area of the interior were inspired by the industrial photo of a very rusty crane taken by the client . A corner sofa and knitted pouffes create a comfortable space for friends to chat. Mixing textures such as the velvet sofa, knitted pouffe, embroidered zigzag cushion create depth. The furnishings for this project were from sofa.com, Habitat, The Natural Curtain Company, Cox and Cox and Handstitch Designs. The alcoves in this large Victorian sitting room needed more storage. The asymmetric shelves, cupboards and drawers within the skirting were designed by Cuckfield Interiors and made by The Old Pine Company in Burgess HIll.